Weekend Cookbook Challenge #14 – Salads – The Roundup! This is my contribution to the Weekend Cookbook Challenge, started my Sara at I Like To Cook. The reason why I am just now posting this is because I have been sitting at home, all day every day, eating this dressing with a spoon…on bread…on leftover raw radishes….off my finger….licking the plate. I digress. Without question, this is the best salad dressing I have ever put in my mouth. The recipe is courtesy of Ina Garten. It was included in her latest cookbook, Barefoot Contessa at Home, which I received for the holidays. 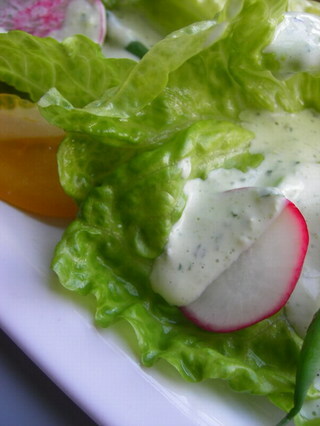 I have been on a Green Goddess dressing kick as of late – its featured on many menus here in Atlanta right now. So, needless to say, when I cracked this book open and went digging for a salad recipe, I was pleased as punch. I made this dressing exactly as the recipe called for – keep an eye on the amount of garlic you include because two cloves might be too much for some folks. Rather than using Bibb lettuce, which would be divine here, I used red leaf lettuce for some additional color. 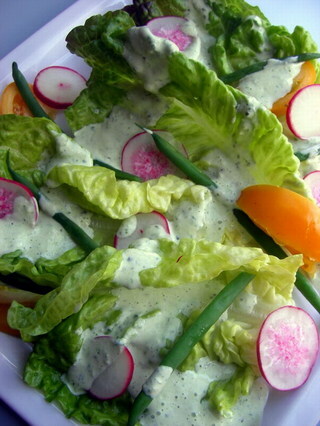 I also added radishes and quickly blanched and chilled green beans for a crudites- like effect in the salad. This dressing would make a phenomenal dip for raw veggies, steamed veggies, the spatula after you spoon it out of the blender, and your (or anyone else’s) finger. – Place mayonnaise, scallions, basil, lemon juice, garlic, anchovy paste, salt, and pepper in a blender and blend until smooth. Add the sour cream and process just until blended. If not serving immediately, refrigerate dressing until ready to serve. – Cut each head of lettuce into quarters, remove some of the cores, and arrange on 6 salad plates. Cut the tomatoes into wedges and add to the plate. Pour on the dressing and serve. I’m waiting to see the rest but I AM BIASED!!!. Oh it is such an addicting dressing…isn’t it? Tami, this dressing sounds great! Do you know if I’m able to substitute the anchovy paste for mashed anchovies? I don’t know if I can find it here in Brazil. Yes! Yes! I now make this dressing all them time! (I make it without the anchovy paste). My kids LOVE it; we call it the zesty dressing! I love radishes in salads, the dressing has a very middle eastern feel to it with the inclusion of the mayo based dressing. I would imagine that if you mashed the anchovy really well and then blended it a little extra, you should be fine! I saw this on the Barefoot Contessa TV show this weekend and then saw it on this website…so I had to make it and it is as good as everyone says it is! I didn’t use anchovy paste because I didn’t have any, but I would eat that all the time! I can’t wait for lunch so I can eat some more!!! I’ll definitely see if I can make this the right way. I hope I can. Thanks for the post.